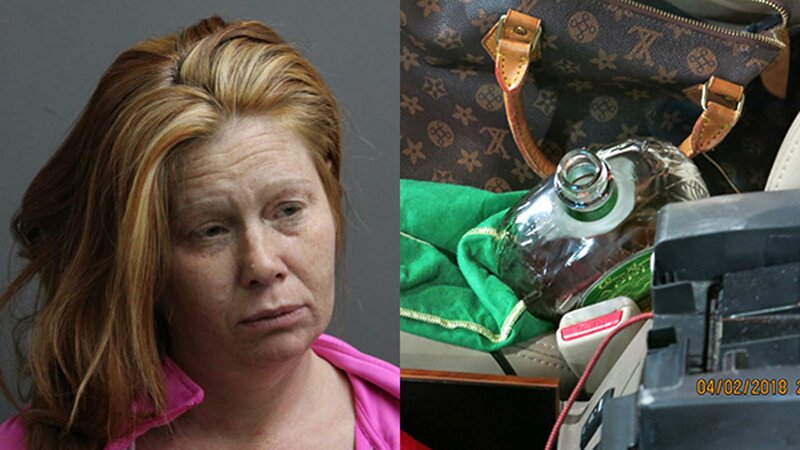 RIVERSIDE, Ill. -- Police in west suburban Riverside have arrested a woman they say is "one of the worst DUI offenders in the United States." Tasha Lynn Schleicher, 41, of New Hope, Minn., is facing several charges, including two counts of felony aggravated drunk driving, two counts of misdemeanor drunk driving, no vehicle insurance, driving while license revoked (for DUI), and transportation of open alcohol while driving. Riverside police said officers encountered Schleicher as they responded to a report of a woman passed out behind the wheel of her vehicle at a gas station at 3346 South Harlem Avenue around 9:30 Monday night. When officers arrived, they said they found Schleicher alert and conscious with the keys in the ignition and the engine running. It appeared she had attempted to fill her car with kerosene, not gasoline, at the kerosene pump, police said. Police said Schleicher appeared to be highly intoxicated and had a strong odor of alcohol on her breath. They also found an open bottle of Crown Royal liquor in the front passenger seat. When officers asked Schleicher to step out of her vehicle, they said she was "in total disarray, not wearing shoes, and her clothes were literally falling off her," as officers escorted her to the rear of the car for a field sobriety test. Police say Schleicher then told the officers she had 11 children and couldn't find them. As officers searched the area, witnesses at the gas station stated she was the only one in the car and they had not seen any children present. When Schleicher refused to perform a field sobriety test, she was placed under arrest. Following her arrest, Riverside police learned that 11 of Schleicher's children had been taken away from her by the state of Minnesota - all for reasons related to drunk and impaired driving situations. When questioned about why she was in Illinois, Riverside Police Chief Thomas Weitzel said Schleicher claimed she was dropping off her 15-year-old son - the only child still in her custody - so he could "party" in Indiana over spring break. Riverside police said they have not yet located that child, but are in contact with Minnesota Child Protective Services and other agencies to find him. While in custody, police said Schleicher told officers she was pregnant, bleeding and having a miscarriage. She was transported to MacNeal Hospital in Berwyn, where the hospital gave her a pregnancy test and determined she was lying. "She's lied about her name, date of birth, Social Security number and even that she was pregnant, leaving officers no choice but to take her to the emergency room for treatment for something completely fictitious. I believe her trip to the hospital was really an attempt by her to escape custody," Riverside Police Chief Thomas Weitzel said. Riverside police said Schleicher has outstanding warrants from three states and six prior DUI arrests out of six states, including Kentucky, Wisconsin, Indiana, California, Oregon and Minnesota. "Schleicher's history of six prior DUI's in six states, with three outstanding warrants from various states speaks to her transient nature. When she was arrested in a state, she would just not show up in court unless she was held in custody. That's one of the reasons for so many outstanding warrants. In Minnesota she was arrested with children in the car, and alleged to have been breastfeeding one child while driving intoxicated," Weitzel said.